In Therapeutic Riding lessons, under the direction of a PATH Int’l. Certified riding instructor, GallopNYC clients learn to sit their horses properly, use their reins to command the horse, and ride at a walk and trot. The horse is led by a trained volunteer and two trained volunteers walk along side. The goal of the lessons is to build life skills in our riders, such as confidence, communication and social skills, and tools for academic success, such as attention span. Our therapeutic programs include Pony Club and the Equestrian Team. 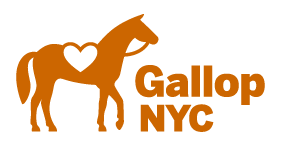 Provides an opportunity for mental health professionals and counselors to work with GalllopNYC to offer equine assisted therapy to their clients. GallopNYC has developed an innovative program to help young people transition to work, by developing specific job skills needed for gainful employment. Developed with funding from Autism Speaks, this program is suitable for any group of riders who want help preparing for the world of work. The capable handling of horses requires responsibility, leadership, and trust. GallopNYC’s Leadership Program helps develop these skills in team-building work with horses. Through the exploration of non-verbal communication with horses, GallopNYC’s Leadership Program helps executive and their and teams to better understand team dynamics. GallopNYC provides Horsemanship Leadership programs to Veterans free of charge. All classes are lead by a PATH Int’l Certified instructor. Every rider will experience the Confidence of learning to be in charge of a large herd animal, the Competence of skills learned, and the Leadership that a horse demands before it agree to accept our commands. We welcome volunteers with special needs, if prior arrangements are made. Offers riding sessions designed for older individuals seeking to improve flexibility, balance and strength, and to have fun. For information on any of our programs contact us at info@GallopNYC.org.